We ended the year by asking you guys which new-for-2011 U.S. coaster you are most looking forward to. After a couple little issues (me forgetting New Texas Giant at first, and someone voting for Gauntlet a ton of times), Cheetah Hunt at Busch Gardens Tampa came out on top, with 148 votes. In second place was the aforementioned New Texas Giant, which missed out on the first few days of voting - but still ended up with a very respectable 97 votes. 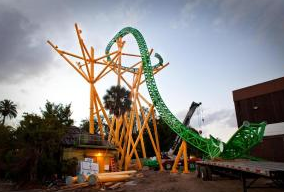 It seems at this point in the game Cheetah Hunt and Texas Giant are going to be the two must-rides of 2011. Third place went to Six Flags Over Georgia's Dare Devil Dive, with 55 votes. Great Adventure's Green Lantern came in 4th place with 33 votes, and the other new Green Lantern at Magic Mountain rounds out the top 5 with 25 votes. Black Diamond at Knoebels, Quassy's Wooden Warrior, the Zippin Pippin at Bay Beach and Canobie's Untamed finish out the rankings. Look for a new poll coming soon!